Children are driven by curiosity. I believe that they are very misunderstood at times because of this. Much of the world tells them “don’t touch that,” “stay away from there,” or “leave it alone.” A better alternative is to provide an environment which encourages children to be carefully guided by their senses. It’s definitely not a free for all with uninhibited chaos though! It is a planned environment with on going training which honors respect. One of my ultimate goals in teaching is to encourage respect for the people and the items in our lives. If the children in my class leave being academic overachievers but lack respect, then I have failed them on one of the most important aspects of life. In my own classroom, I am constantly trying to create an environment with many opportunities to practice being intentional. My biggest training ground has been our “greenhouse project.” I have to humbly admit that this was somewhat of an accident. Initially, this was to be a fun place to observe growth and expand our science and math activities and to provide healthy snacks. Little did I know how much I underestimated one of the greatest treasures that it offered us: the process of cultivating respect. I have made our greenhouse available as an opportunity to explore each day. It is amazing how the plants easily transitioned into teachers of their own. Our class has learned to listen to the plants and follow their lead. When the cucumber needs more time to grow and develop, it’s sharp peel and prickly leaves instantly communicate this to the little fingers. Once the cucumber turns softer and is about to fall off the stem, then we know it is telling us that it is time to interact and enjoy it. When these three and four year olds see saggy leaves, they know that the squash is asking for a drink because it is thirsty. I especially love how these kiddos know these plants so well that they can identify them by the leaves. Even though none of the strawberries have appeared yet, it is still known as the strawberry plant. They will just point and call each by name: squash, cucumber, watermelon, peppers, basil, oregano, tomatoes, strawberries, marigolds, zinnias, pansies, beans, lettuce, and lavender. In the beginning, I had to accompany the children in through the latched door and allow them to touch with a “one finger touch” in order to guard the plants. In a few short days, each child came to the realization that plants needed to be cared for gently. If they really want to pluck something, they are allowed to pick lavender with permission. All of the other plants may only be touched though. I felt that it was important to have the children water the plants as well. I put a container of water inside of the greenhouse with pipettes, so that the children could water whichever plants they wanted. Plus since it is a pipette, I don’t have to worry about any of our plants getting too much water. Our greenhouse is now part of our daily routine. The latch is no longer needed as they have increased their awareness and understanding of how plants are to be treated. There is not a day that goes by in which someone does not ask to go in the greenhouse. The process of tending for the plants is about 5-15 minutes, depending on the child. For the most part, they are allowed to stay in as long as they like. I love how the garden has become an oasis as it invites the children to come in, relax, and to enjoy. Time seems to slow down, and there is an added sense of calm. 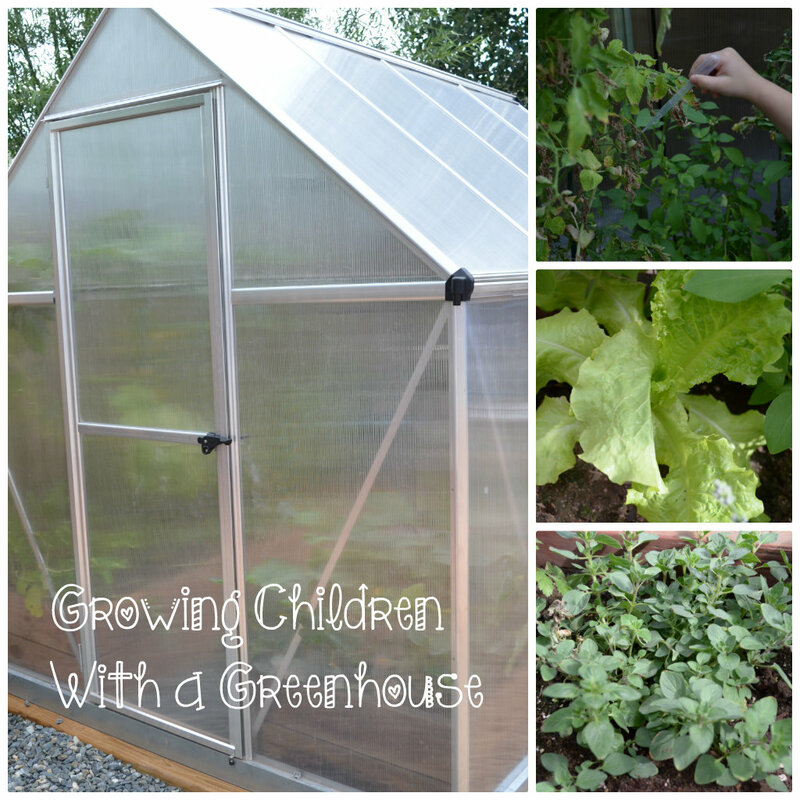 I have loved this gardening process with my preschoolers, and what a haven it is! There is much more to plants than I ever understood, and I am sure that I am just beginning to understand this incredible process. Thank you lifeoftransition. It is so true! I am so excited to see how this will continue to impact us all. I love your greenhouse and it’s been so fun to see what all Alice has learned through it! Just the other day she insisted she needed three things…soil, seeds, and water. I got those things for her and watched as she filled a pot, planted her zucchini seeds, and watered them. Now, they’re growing like crazy and she couldn’t be more proud! Thanks Melissa! I hope you get a greenhouse one day. I bet that zucchini will be extra yummy with all the TLC Alice is providing it :). Katie – I’ve had a brown thumb my entire life but your post is certainly inspiring. What a great way to teach young children. Featuring this at Family Fun Friday! Thanks Monica! Until three years ago, I unintentionally killed every plant I owned in record speed. My kids are way ahead of me since they are starting this so young, and it’s so much fun to learn about together. 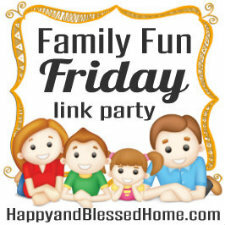 I am honored to be featured for Family Fun Friday!